Yixing is situated on the western side of Lake Taihu, about 130km southeast of Nanjing, in the Chinese eastern province of Jiangsu. While archaeological excavations in the area have yielded potsherds dating back to the Neolithic period, Chinese references recognize the beginning of the characteristic Yixing ware as about the 16th century. 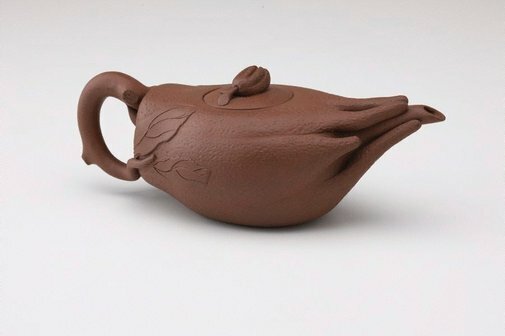 Yixing ware, a large proportion of teapots, is distinctive because of the body: a high-fired, often smooth, reddish-brown stoneware. Yixing teapots are usually small, even smaller than this, as it was believed by tea connoisseurs that smaller vessels were best for retaining the bouquet and flavour of tea. The pots were made for local use as well as export to European and Thai markets. (It was small Yixing teapots that in the 17th century the Dutch East India Company sent with their tea shipments to Holland to provide Dutch merchants the opportunity to taste the tea). The variety of shapes of Yixing teapots was enormous, ranging from the geometric to the naturalistic. Naturalistic shapes included the pomegranate, peach, melon, the trunks of the bamboo, prunus and pine, and also this shape, that of the citron, Buddha's Hand ('Foshou'). The Buddha's Hand is an inedible citron, composed almost entirely of rind and terminating at the head in long narrow processes like fingers. It has a powerful and fragrant odour and was used as an offering in religious festivals, as well as for scenting rooms. The fruit connotes Buddhism because its form resembles a classic position of Buddha's Hand. Asian Art Department, AGNSW, 1982.